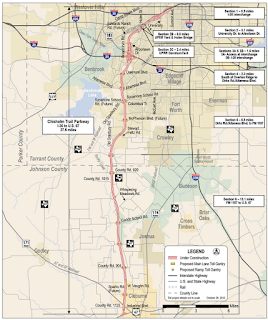 The Chisholm Trail Parkway is a 27.6 stretch of Toll road that will help connect Cleburne and Granbury to Downtown Fort Worth. This stretch of highway was built to increase the accessibility and consequently the desirability of housing that it influences. The (NTTA) North Texas Tollway Authority has been constructing this $1.4 Billion project since 2010 and expects to finish sometime in Spring of 2014. 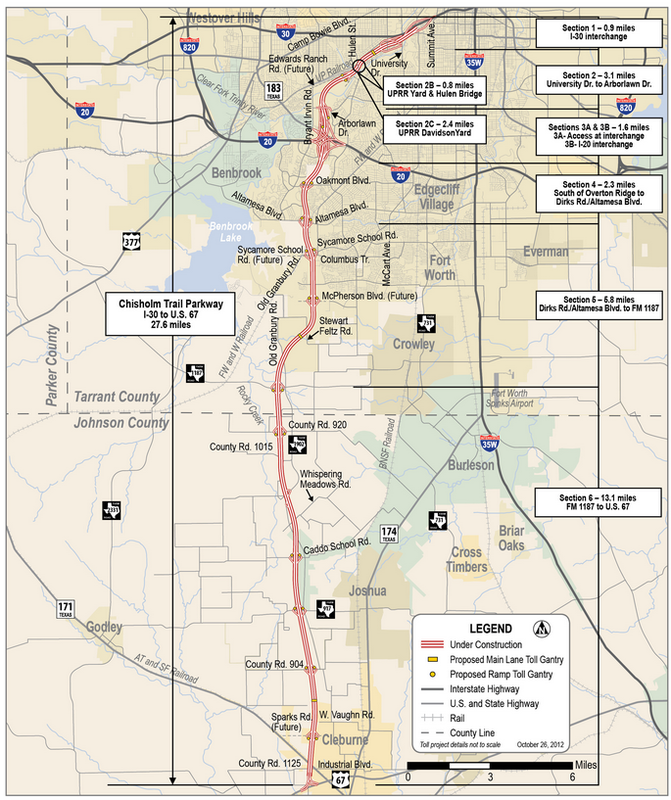 How will the Chisholm Trail Parkway affect the value of my house? When asking how this project will affect the surrounding communities one should realize that the NTTA is a private company. All of their projects are NOT a part of the state highway system. Even though the NTTA is sanctioned by the Texas state government to acquire land and build roadways on it, all of the land that is built upon is granted to the NTTA by partnering cities. They do not collect tax revenue for their roadways and funding for their projects are generated through bonds called “turnpike revenue bonds”. All collected tolls go to help repay those bonds. What does that have to do with property value? Land for these projects is granted to the NTTA by partnering cities. This means that partnering cities are giving up taxable land, rolling the dice that the toll road will increase taxable revenue and property value in the adjacent communities enough to offset the donated land and then produce a profit for the city. This additional tax revenue can be attributed to developers moving to areas that are now more easily accessible. Commercial developers that improve the quality of life in a once desolate area by opening new shopping and dining areas. And residential developers that are wanting to build subdivisions and capitalize on increasing property values for land in an area with diminishing supply. Besides Burleson and Cleburne, what areas are going to be most affected? Como/Chamberlain Arlington Heights: The area known as Como and Chamberlain Arlington Heights has been a transitional area for years now and there is good reason for it. Just a few blocks from each other, you can find housing for $18/Sf to well over $160 /Sf. I would expect this are to blow up in the next 3-5 years. This area is nestled between two higher end subdivisions that contain generally the same type of older frame housing. It wouldn't surprise me if developers already have plans to swoop in and buy up any and all supply of the 2/1 beaters in this area directly from the homeowners and fully rehab them and rent them out at reasonable rates. This is a great place to buy and hold. Benbrook and Wedgwood: Benbrook is a small city know for its great schools and safe communities. It’s kinda like that movie Pleasantville but in SW Tarrant County. The trip from Benbrook or the super large Fort Worth subdivision of Wedgwood to Downtown Fort Worth in the morning can take commuters 20-25 min. The new Tollway should cut the commute in half allowing top professionals and executives live in these outlier areas that are already built out, therefore, potentially driving up prices in the near future. Please feel free to comment and let me know if there is anything in particular that I should write about for my next blog entry. As always, if you need investment property or investor financing for your next investment deal, call me and I’d love to help.